The kink vs. bend rule states that kinked parts must be replaced (no argument there), but bent parts may be a candidate for repair (wait a minute?!?). The kink vs. bend rule is no longer as simple as it sounds. Let’s take a closer at how this rule has evolved with the vehicle. Kink: a sharp bend with a small radius over a short distance. Bend: a gradual change in shape between the damaged and undamaged area. A part is considered kinked if, after straightening, there is a permanent area of deformation that will not return to its original state and shape without the use of excessive heat. Let’s get into the examples of when a bent part requires replacement. If the OEM states that a certain metal or part shouldn’t be straightened, then that part should be replaced (even if it’s only bent). 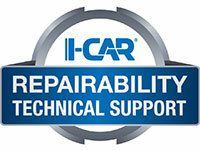 Follow the OEM repair information. The stronger the steel, the less repairable it becomes. A slight bend in an ultra-high-strength steel (UHSS) part may crack when straightened (if it is able to be straightened at all). Best Practice: Do not straighten parts that are above 600 MPa unless specific documentation exists from the OEM. This is due to possible cracking and tearing of the part and possible damage to adjacent panels. Visible cracks or tears in the metal are a “permanent area of deformation that will not return to its original state and shape” and therefore should be replaced. A part may not look like it’s kinked, but it may not be able to be straightened without cracking. If straightening steel 600 MPa or above is allowed by the OEM, a dye penetrant should be used to ensure no micro-cracking has occurred. If micro-cracking has occurred, it should be replaced. If the part is bent, but the thickness or strength of the metal will not allow for straightening without leaving an area of permanent deformation, then the part should be replaced. Damage to curved or highly formed areas is more difficult to straighten. Bends to these areas may not return to their original state and shape and warrant replacement as well. Kinked parts require replacement, but there are many bent parts that also require replacement due to the collision energy management improvements in today’s vehicle structures. When determining if a part should be straightened take these things into consideration to perform a complete, safe, and quality repair.